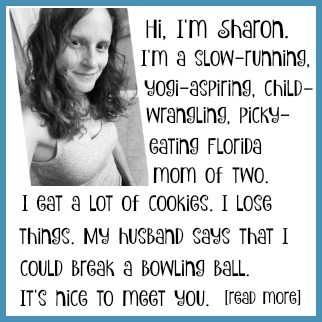 I am participating in a campaign sponsored by The Pitch List and Simply 7 Snacks. I received an assortment of complimentary Simply 7 Snacks in exchange for my honest review. It’s no big secret that I love to snack. It’s also no secret that I don’t always make the best snack choices. I never met a chip or a cookie that I didn’t like. (Except oatmeal raisin. Blech.) I’ve passed my love for snacking down to my kids, too. 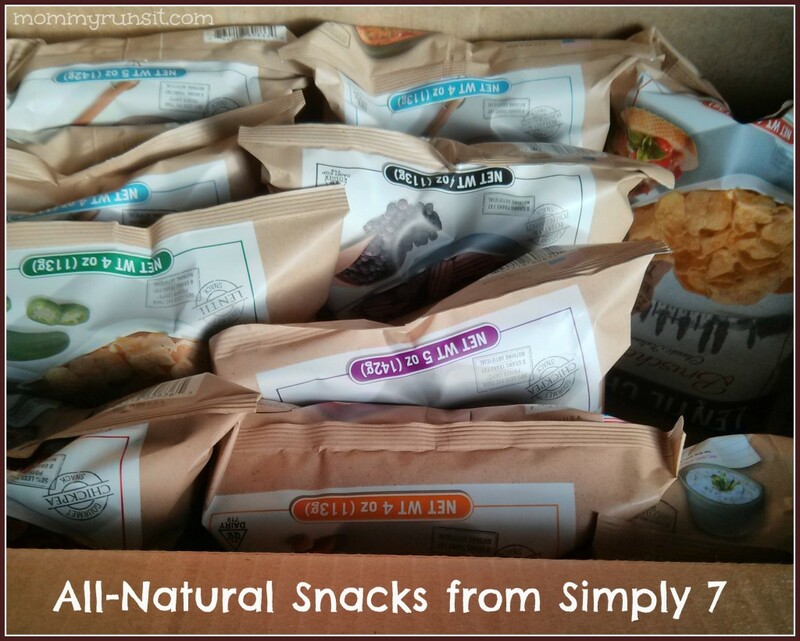 So when I was given the opportunity to review all-natural, better-for-you snacks from Simply 7, I jumped at the chance! 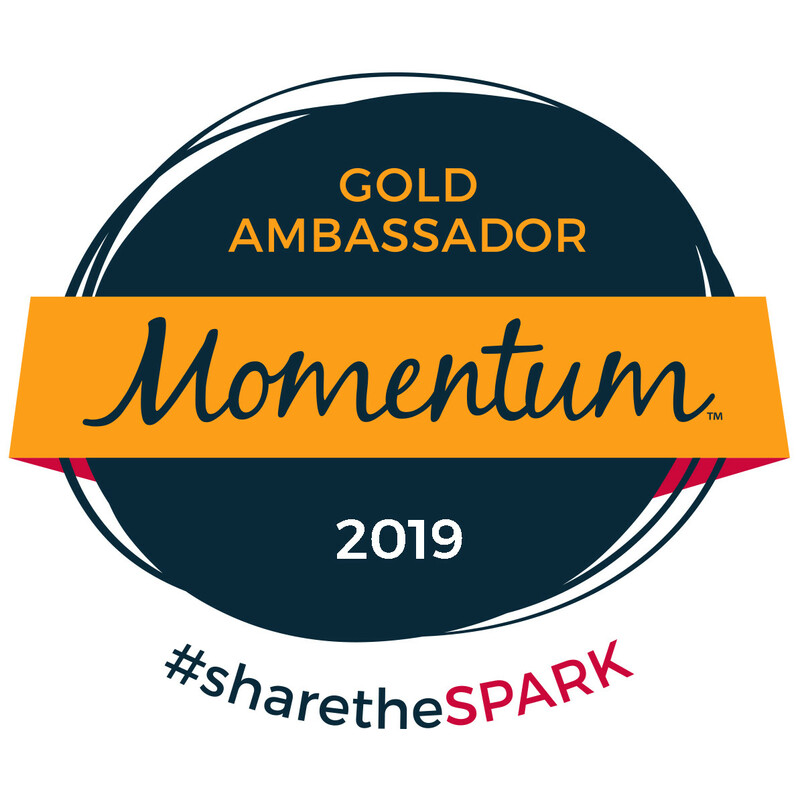 Simply 7 is built on the principle that the consumer should be able to identify the raw vegetable, fruit, grain, or legume that their snack products come from. So their chips are made from Hummus (chickpeas), Lentils, Pomegranates, and Quinoa. I have to admit that I was a little skeptical about trying chips that were made from something other than potatoes or corn. But overall, this snacka holic was pleasantly surprised. My family had the opportunity to sample several varieties of Hummus, Lentil, and Pomegranate chips. The Quinoa chips are brand new, and I’d love to review them in the future as well. Hummus Chips: The Hummus Chips were my family’s favorite by far. They are made from chickpeas and come in 4 flavors: Sea Salt, Roasted Red Pepper, Spicy Chili Pepper, and Tomato Basil. My kids liked the Tomato Basil best, but I love the Spicy Chili Pepper – slightly sweet with enough kick to burn your face off. The chips are nice and crunchy – similar in texture to a corn chip. I would definitely buy these in the store as a snack, and I wouldn’t feel guilty about keeping them in the house. 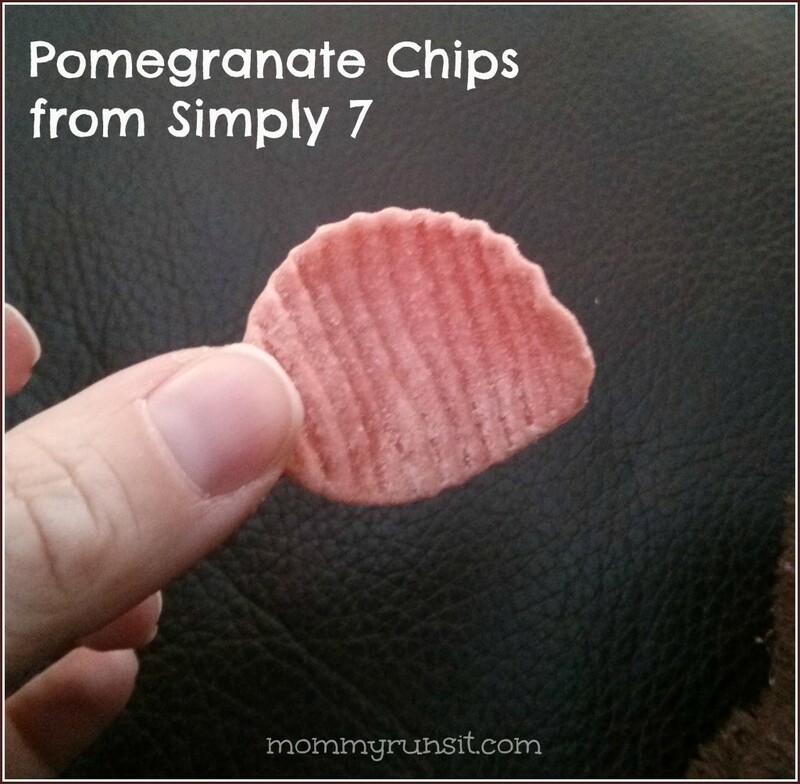 Pomegranate Chips: The Pomegranate Chips have the best texture of the three kinds of chips. They are most similar to a traditional potato chip – crunchy and ridged. But I couldn’t quite get over the idea of eating pink chips. Also, the seasoning was a bit mild for my taste. The predominant flavor was the sweetness of the pomegranate. I might have enjoyed these more if they’d been more heavily seasoned. Still, if you’re looking for a mild, crunchy, sweet & salty snack, I’d give these a try. They come in Sea Salt, Black Pepper, and White Cheddar. Lentil Chips: The Lentil Chips seem like a lighter version of the Hummus Chips – closer to a popcorn chip than a corn chip. The flavors are great – Sea Salt, Creamy Dill, Jalapeno, and Bruschetta. My favorite was the Creamy Dill, but all four flavors were tasty. Still, the Hummus Chips were the clear winner of the bunch. Now for the fun part – The Pitch List is proud to host a Simply 7 Giveaway! Just enter on the Rafflecopter below for your chance to win some of these tasty treats with the Pitch List! 10 winners get a box of Simply 7 chips. Good Luck, and happy snacking! My family loves Simply7! Delicious tasting good for ya chips! 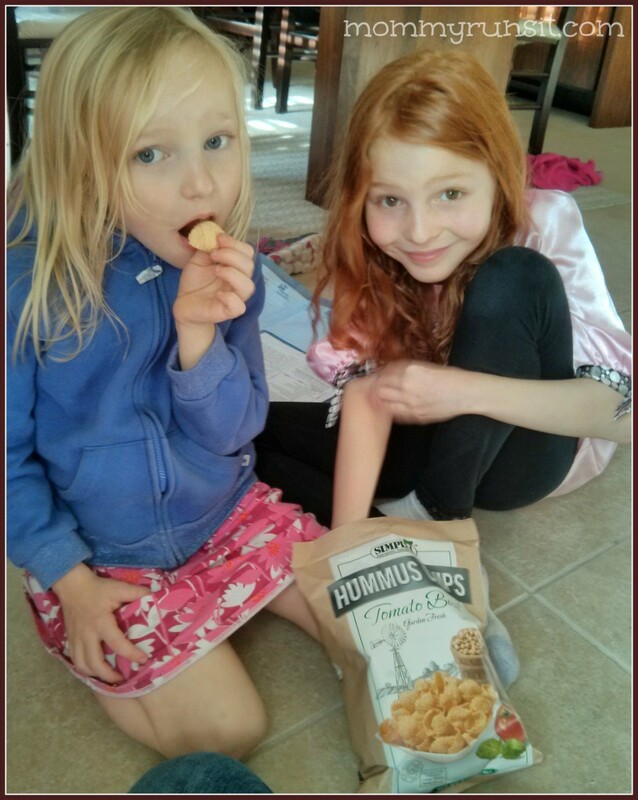 Our family loves the Hummis chips as well. 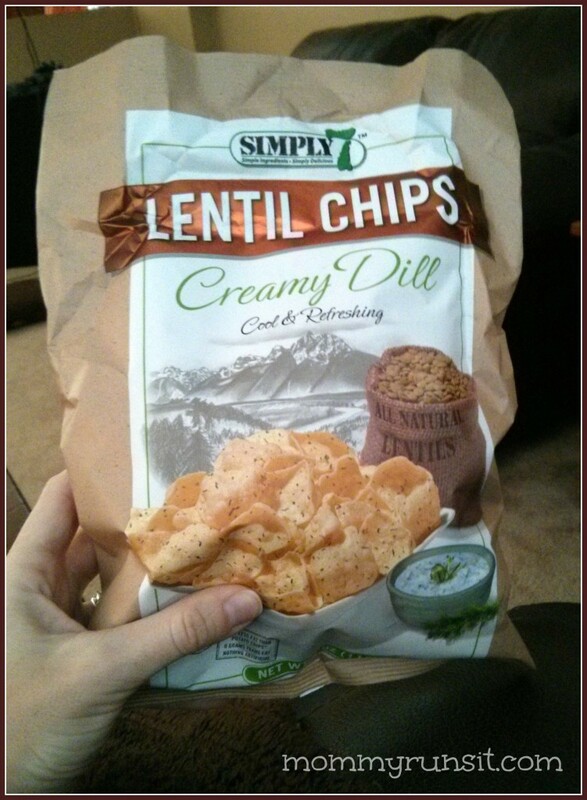 I really love the Creamy Dill Lentil chips! Yum! I am addicted to these Pomegranate chips! Those look so yummy! I am a pomegranate fiend! hahaha Thanks for the awesome giveaway! I’d love to try the pomegranate with spinach sounds delicious. I love spinach dip. I’ve been wanting to try these products forever! they sound so delicious. Thanks for the giveaway! Creamy Dill dip sounds yummy! The Traditional Hummus Dip would be lovely with the yummy flavor varieties of Simply 7! I love hummus as it’s full of nutritious chickpea protein too! Thank you! The Creamy Dill Dip looks fabulous. Thanks! I’ve never heard of these. They sound really interesting and delicious! This is awesome! I am a big fan of veggie chips 🙂 Thanks for sharing! Oh! If you get a chance, I am hosting a giveaway too! ok these sound delicious. 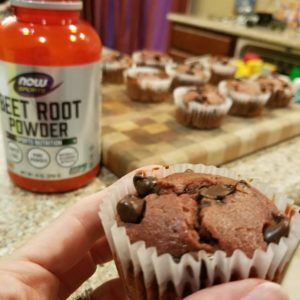 as someone who just housed anything I could find in the house last night thanks to lovely PMS, I would love to be able to keep some healthier options for when I just can’t pass up on that craving!!!! These chips look/sound interesting. Since I like hummus, I’m assuming I would like the hummus chips, too. I have no problem with pink chips, but I’m not sure I’ve ever eaten anything pomegranate-flavored or an actual pomegranate. I think that sea-salt flavor is an acquired taste, but I’ve grown to like it so maybe I would like the lentil sea salt flavored chips. I love their Creamy Dill Dip recipe as it sounds delicious for Simply 7 Chips!